Cuban, Kirkpatrick & Peck (2001) suggested that the majority of teachers in US are not computer users. If teachers aren’t using the tools, then the impact on teaching and learning is not present. In my international school setting, this is not the case at all. All of our teachers are provided a laptop when they begin with our school and receive training on them. There is an expectation that attendance, grading, reports, planning are all on our LMS systems. Thus, technology use is not an option rather a mandate as part of being an employee at the school. In terms of teaching and learning, much of this is also done digitally, however, not mandated in the same way. That being said, with digital resources for classes, teaching teams can share the workload easily by sharing resources with a click of a button. Teachers can view student work using tools such as Teacher Dashboard easily to support them with their work without having to take bags of workbooks home to review. Cuban, Kirkpatrick & Peck (2001) suggested we need to know more than how often students are turning on computers but rather what students are doing with them while they are on. If it is simple drill and kill practice all of the time, the impact on learning will be minimal as they are not developing skills that are transferable in other scenarios. As I was reading about Cuban, Kirkpatrick & Peck (2001) study, I felt our school had much more access to technology than the schools in the study who had computer labs. With a 1-to-1 programme at our school, each student has access to connectivity and software at all times whether at home or school, thus, increasing the use of computers. Teachers do not have to worry about booking the lab or if the internet connection will be working. This allows for technology to be used at a moment’s notice in class or left to the side of the table when not needed. The 1-to-1 programme allows for technology to just be another tool for students to use if deemed necessary. Somekh (2004) outlines 4 examples of institutional resistance to change in the article. ICT is often seen as a separate subject rather than being integrated into every subject. Teachers often use a one-size fits all, linear model where they start from scratch and teach all the skills rather than differentiating for the needs of the students who are well advanced. Students with access to technology is compounded by the kinds of ICT use. Finally schools restrict access to a number of websites out of fear of unknown and need to be extra cautious in schools. What we have learnt is, that in order for technology to be effective, it needs to become a part of the human activity (p. 177). I think there will always be resistance to new technologies entering into the educational realm. 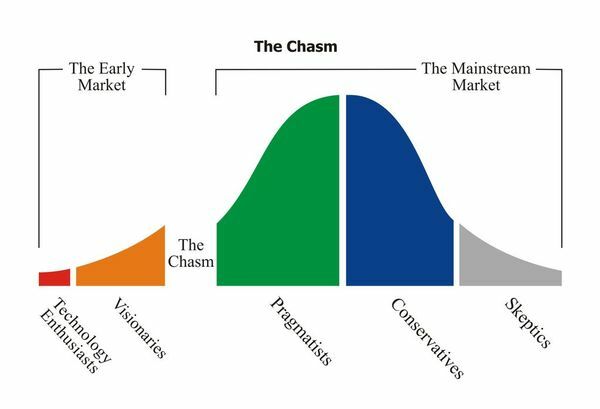 Geoffrey Moore’s book ‘Crossing the Chasm’ (2001) outlines that there is always going to be a bell curve when it comes to technology starting from technology enthusiasts who are willing to try anything as soon as it is available to the skeptics who are the last to give in to technology initiatives if ever. I actually think this is a good thing. It is good to have a variety of perspectives and varying adopting times. It gives the visionaries time to try it out and imagine where it can go which convinces the pragmatists and conservatives to make the transition once there is some proof it will work. When I run trials with new technology tools, this is exactly how i approach it. I access those most willing to try, see what the results are, reflect and analyse if this is the best move forward as a school and use this data to help move the school forward. In my school, technology is not just the responsibility of one teacher. Rather it is the expectation that all teachers teach ICT within their classrooms. As the Technology Coach, I support teachers in doing this but at the end of the day, we all need to weave ICT into our lessons when appropriate. This takes the ownership of ICT off just a single specialist, just like we are all language teachers to an extent. Integration of subjects has become the norm not that anomaly. As a school who uses a transdisciplinary approach to learning through the IB framework, students have all subjects being intertwined. As I am reading the articles by Somekh (2004), I wonder what his findings would be today 12 years later. Cuban, L., Kirkpatrick, H., & Peck, C. (2001)’s article is now about 15 years after it was written. What are the more recent studies arguing about the impact or lack thereof with technology? Is there really as much discrepancy between home and school? When my students were doing something at home (ie 3D printing), we found a way to bring it into the classroom. I let the students drive their own learning and incorporated the tools they wanted to use. I use Edmodo to mimic Facebook for privacy, age restrictions and safety but still allowing them the social aspect of media. With a student who struggled with creating content and developing his e-Portfolio, I used a mobile device with Blogger to mimic what he was doing with Instagram on his own time. Are these the same tools they are using at home - no. But they are replicating their uses at home in an appropriate and safe way for educational purposes. Because I was making the effort for them, they were also making the effort and I saw improved work quality and quantity. Technology can have a positive impact on learning, community and teaching if used in authentic, meaningful and innovative ways. Cuban, L., Kirkpatrick, H., & Peck, C. (2001). High access and low use of technologies in high school classrooms: Explaining an apparent paradox.American Educational Research Journal, 38(4), 813–834. Moore, G. A. (1991). Crossing the chasm: Marketing and selling technology products to mainstream customers. New York, N.Y.: HarperBusiness. Somekh, B. (2004). Taking the sociological imagination to school: an analysis of the (lack of) impact of information and communication technologies on education systems. Technology, pedagogy and education, 13(2), 163-179.